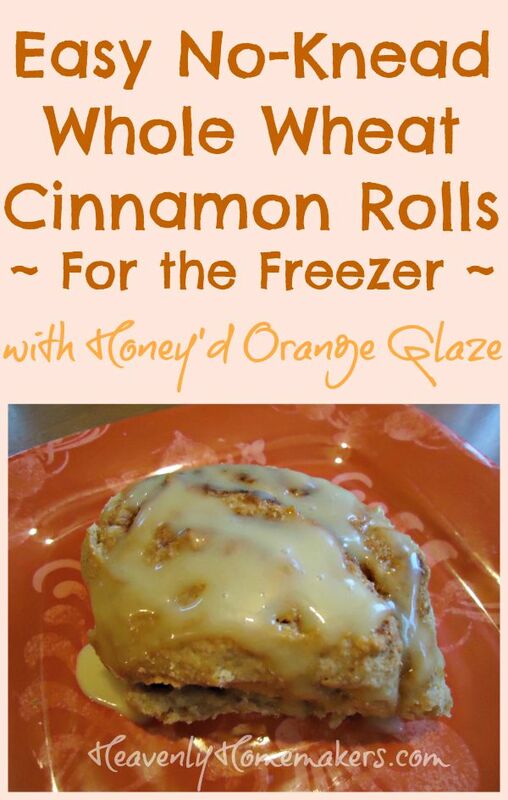 Easy No-Knead Whole Wheat Cinnamon Rolls For the Freezer ~ With Honey’d Orange Glaze! No-knead breads are THE WAY to go. I’m not sure that my dearly missed, hard working grandma would be too pleased with me about this – but I’ve decided that kneading bread dough just isn’t my favorite thing. I mean, I’ll do it if I have to. But I’d rather stir ingredients, smile at the pile of dough (you know, for encouragement), then walk away. I figured that at the very worst, I’d have little hard cinnamon roll hockey pucks we could dunk in milk. So I did it. I walked away from my dough without kneading it. Did it work, or did it work? 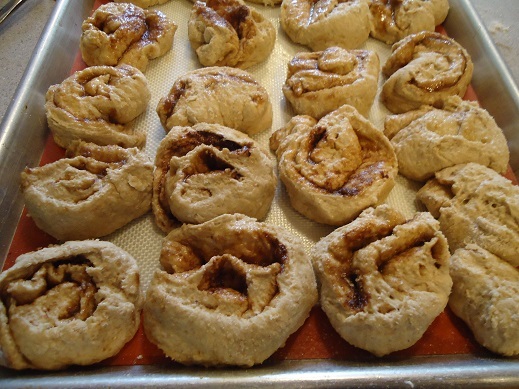 Thus, my Whole Wheat Cinnamon Roll recipe is being turned into a No-Knead Whole Wheat Cinnamon Roll recipe because our lives are too full from all the hard work it takes to think about Grandma scrubbing all of the manure-crusted clothes on a wash-board. What you see here is absolutely not a picture of me kneading the dough. It is simply me working a little flour into the dough after it rose so that I could roll it out without it sticking to the countertop. After I rolled it out, I spread melted butter over it and sprinkled a little sucanat and cinnamon over it. I then proceeded to cut individual rolls, making a huge mess in the process. My rolls went on a pan in a most unattractive way because I leave perfectionism up to the perfectionists. Do not poke fun. They can’t help how they look. 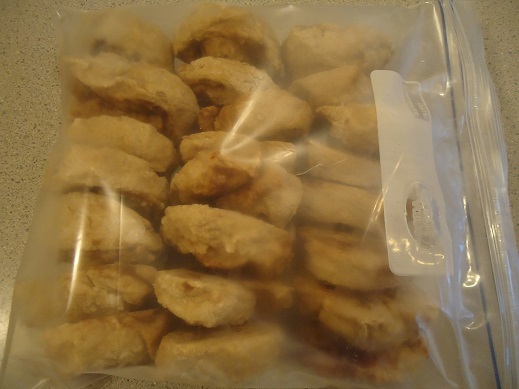 I froze the dough rolls on the pan, then transferred the frozen rolls to a freezer bag for another day. I will use them when I am busy not having to pluck a chicken for our dinner. 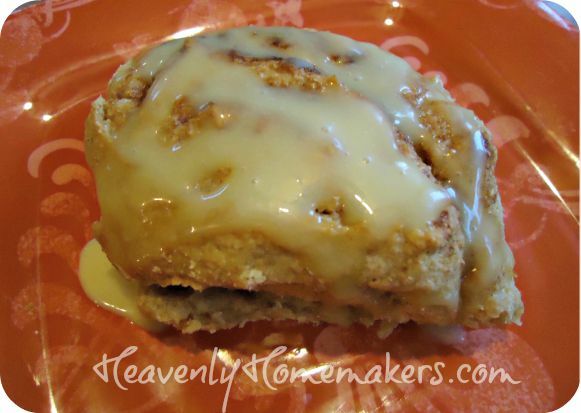 Easy No-Knead Whole Wheat Cinnamon Rolls For the Freezer ~ With Honey'd Orange Glaze! In a large bowl, mush the yeast and 2 teaspoons honey together with the warm water and set aside. It will begin to form bubbles soon. In the meantime, stir together milk, butter, ½ cup honey, and sea salt on the stove until the butter has melted and the mixture has reached 120°. If the temp exceeds this, allow it to cool before moving on. Pour the milk mixture into the bubbly yeast mixture and stir. 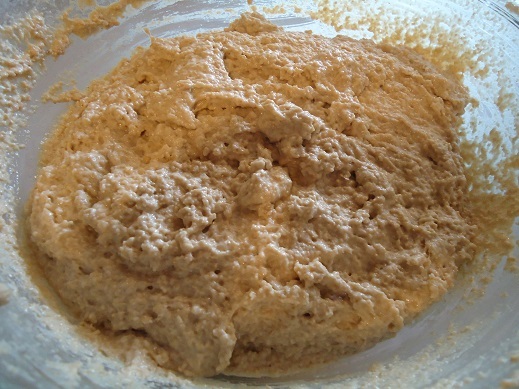 Mix in flour, two cups at a time until a nice dough has formed. 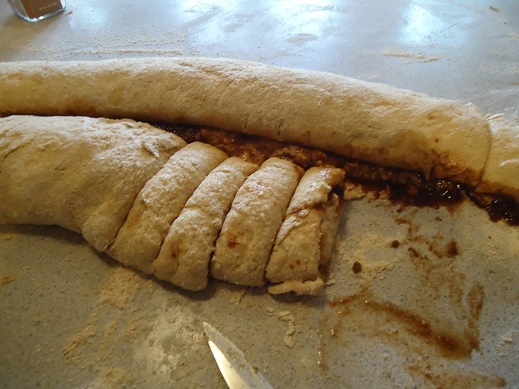 Cover the dough and allow it to rise for at least one hour, or until you remember that you were making rolls. 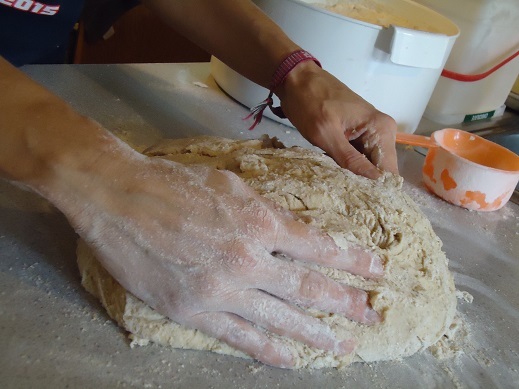 On a well-floured surface, roll the dough to about ¼ inch thickness. Spread melted butter over the rolled dough. Sprinkle with sucanat, then cinnamon. 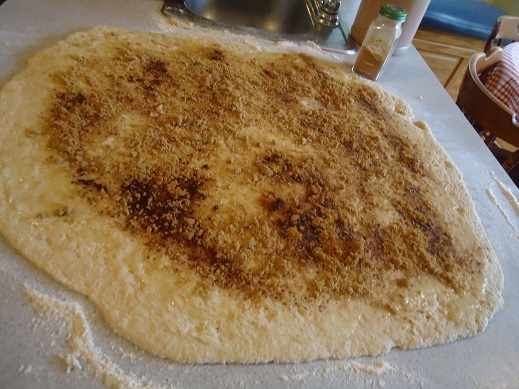 Roll up the dough from the outsides of the "dough circle" as pictured above. 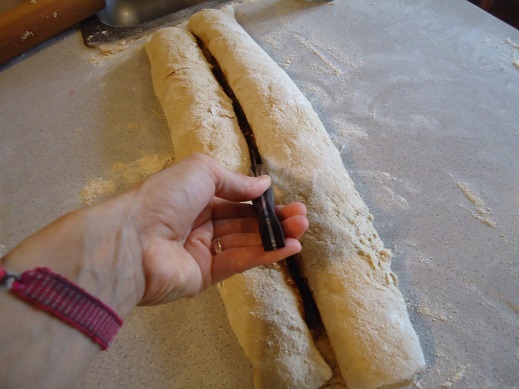 Cut apart the two rolled lengths, then cut the dough into ½ inch thick rolls. Place the rolls side-by-side on a baking pan. Allow them to rest/rise for about 20 minutes, then bake the rolls in a 350° oven for about 25 minutes or until they are golden brown. Whisk ingredients together on the stove until smooth. Drizzle over baked cinnamon rolls. Place the prepared rolls about a 1/2 inch apart on a baking sheet. Freeze for about two hours, then transfer them to a freezer bag. Store in the freezer for up to two months. To bake, place the desired number of frozen rolls on a baking pan. Cover and refrigerate overnight. (In the winter, I leave them on the countertop overnight.) Place the rolls into a cold oven, then turn the oven on to 350°. Bake as directed above, adding a few minutes of additional time as needed. These are deliciously easy, and mostly low in sugar! They kind of resemble those frozen orange rolls you can buy in the freezer section – except that these have a little bit of nutritional value and not nearly as much sugar, so we can all rejoice. Are you a perfectionist? Did my frozen roll picture cause you to cringe? I’m just a “get the job done and move on” kind of girl…which basically means that I am a mess when I cook. These sound delicious, especially the orange glaze. I think you forgot to say something about the mooshed yeast and honey with the WARM WATER. I mean most of us would probably figure it out but you never know. Thanks for some awesome recipes. I use a lot of them! And I also love seeing what you bought at the store and online. I have bought several things because you did. Ha! Thanks again! About smiling to the dough: my 3yo insists on singing a lullaby to the resting dough/batter whenever she helps me cook! Maybe that will evolve to smiling to the waffle batter! Ok, have a question. I’ve never had any luck freezing whole wheat dough. 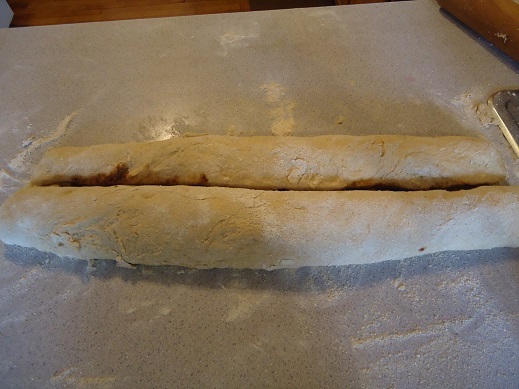 I’ve tried about 6 times now to make whole wheat rolls and then freeze them raw to thaw, rise and bake later. Everytime I do it, I get “little hockey pucks” as you describe. I’ve used at least 3 different recipes. The last time I baked a few right after making the dough, so I would know if it was the dough itself that was the problem or the freezing aspect. It seems to be the freezing that messes mine up. It’s like once the dough has been frozen it won’t rise (even outside on a 100 degree day) Anybody out there got any tips? 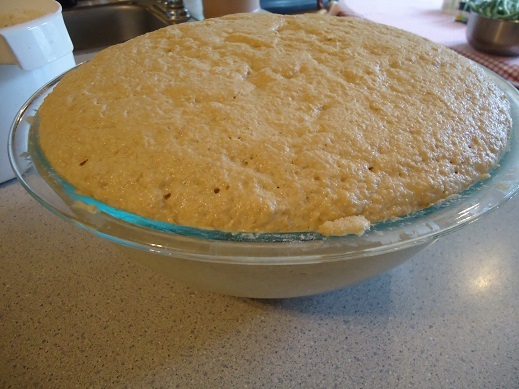 I think you’re supposed to let the dough rise before you put the butter, cinnamon and coconut crystals (or whatever sweetener you want to use), then roll, cut and put in freezer. That way you just plop them in the oven when you want to bake. These sound delicious and I’m definitely going to try them! On my phone the innards measurements all say /2. Is a number missing there or is my phone just messing it up? Yup, all fixed. Off to clean up my kitchen so I can have my daughter make these :D.
Oooh. Ive been craving these. I love your sense of humor, and I think they look fine! That expression… don’t lay the best be the enemy of the good. Or something like that :) thanks for this!